Political science events on and around campus. The Department of Political Science at Rollins College and Baylor University sponsored a conference on Religion and Politics on January 30, 2015. 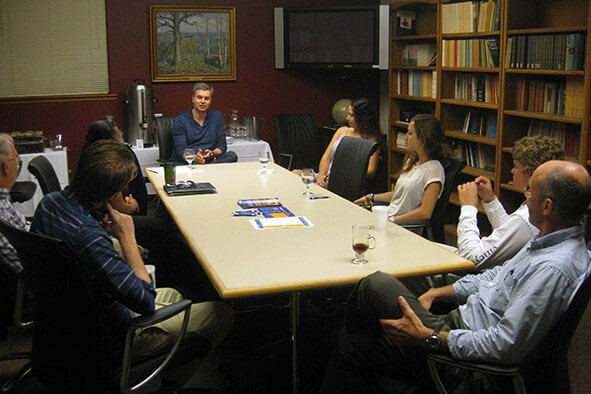 Students and faculty talking to Chris Hecksher ’90 about the value of a liberal arts education. Chris lives in Hong Kong and is head of Cisco Systems operations in Asia. For more info, see this recent feature on Chris on Rollins360. 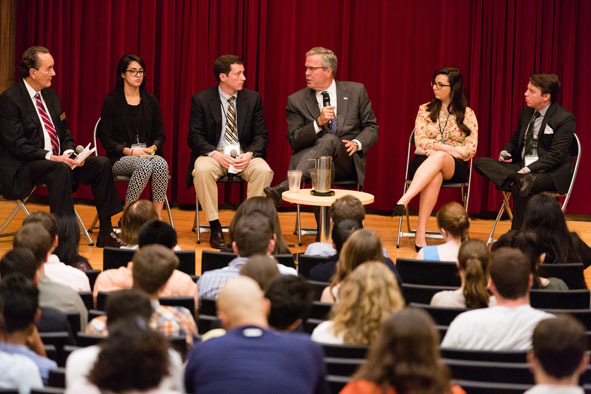 Events, like this discussion with former Florida govenor Jeb Bush, allow political science students to extend their education beyond the classroom. Join Dr. Mike Gunter, Professor, and Chair of the Political Science department on as he discusses his new book on climate change - "Tales of an Ecotourist". Voting is a fundamental right in the United States, a basic requirement for democratic governance. The last few years controversial voting requirements have been adopted in some states. Recently, President Trump created the “Presidential Advisory Commission on Election Integrity.” The Commission is charged with studying “the registration and voting processes used in Federal elections” and identifying “vulnerabilities in voting systems” that could lead to voter fraud. Join Myrna Perez from the Brennan Center for Justice at New York University School of Law for a public presentation on the current voting rights environment in the United States, President Trump’s commission on voting integrity, and the adoption of a restrictive voting requirement in states. The public presentation is Friday, October 27, 2017, from 3:00-4:00 in Bush Auditorium. This event is sponsored by the Political Science Department and the Program in Public Policy and Political Economy. Are you interested in the presidential election? Are you worried about the presidential election? Join Rick Foglesong and Don Davison in Dave’s Boathouse to inaugurate a new series, “Politics on Tap.” We will share our thoughts about the current state of the presidential election such as: Can Donald Trump really win the presidency? How has he changed the Republican Party? Given the topics, we will hold our events during “Happy Hour” in Dave’s Boathouse. Please join us for a conversation about current political topics. Also please invite other students to join the conversation. Stay posted for new dates during the next academic year for “Politics on Tap”. We hope to see you there. The Department of Political Science at Rollins College and Baylor University sponsored a conference on Religion and Politics on January 30, 2015. 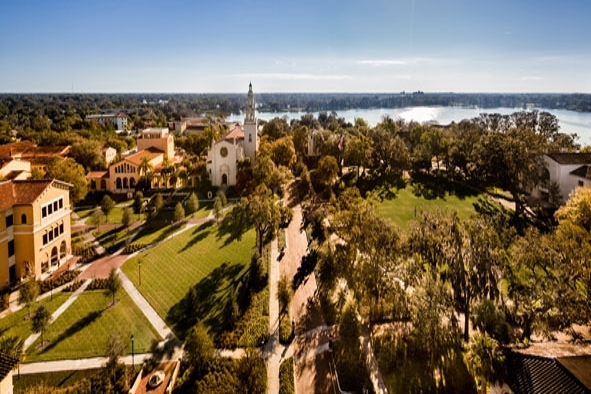 The conference was held on the campus of Rollins College. 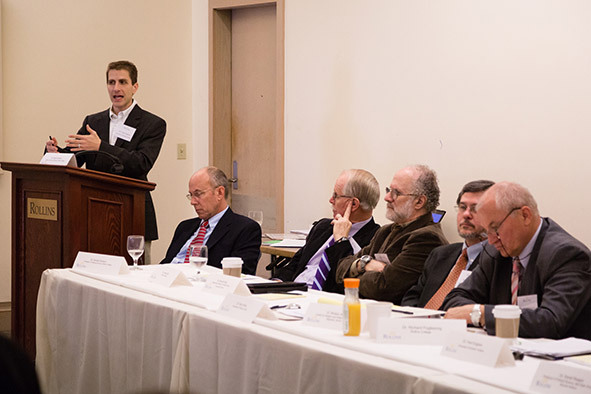 The conference included a morning roundtable discussion of contemporary developments in the area of religion and politics in the United States. The afternoon featured panels for paper presentations dealing with a broad range of topics concerning religion and politics either in the United States or other countries.